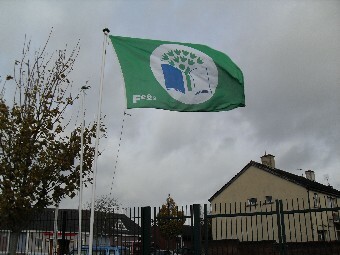 Bunaíodh Gaelscoil Mhachan I 1986 nuair a tháinig grúpa tuismitheoirí le chéile chun oideachas tré mhéan na Gaeilge a lorg da bpáistí. I 1987 fuair an scoil aitheantas ón Roinn OIdeachas. Bhíomar lonaithe i sean-tigh Rinn Mhachan agus seomraí réamhdhéanta go Feabhra 2001, nuair a bhogamar go dtí ár bhfoirgneamh nua ar Avenue de Rennes. I ndiaidh sin bhí orainn síneadh a thógáil i 2007, a d'oscail Mícheál Martin ar an 23ú Meitheamh 2008. Gaelscoil Mhachan was founded in 1986 when a group of parents came together in an effort to provide education through the medium of Irish for their children in their area. The school was officially recognized by the Department of Education in 1987. We were originally located in Ringmahon House and surrounding pre-fabricated buildings until we moved into our beautiful new building on Avenue de Rennes in February 2001.The Minister for Foreign Affairs, Mícheál Martin, opened the extension on the 23rd of June 2008.